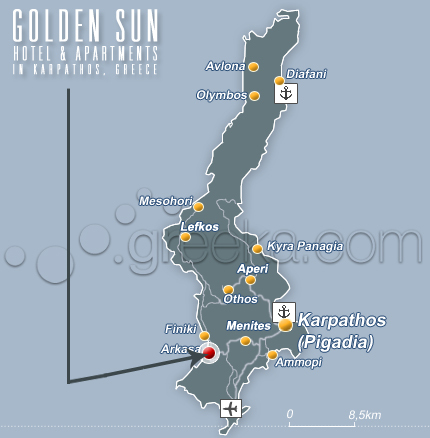 On the south west part of Karpathos island overlooking the beautiful beach of Arkasa sits our hotel ''Golden Sun''. It has 12 very large apartments (5 people) and 3 studios all have private balcony with sea view, full kitchen facilities, satellite TV, a/c and safe box. In our reception area you will find an internet cafe, and snack bar. For an unforgettable holiday come and enjoy our Luxurious swimming pool, our friendly hospitality in a quiet pleasant atmosphere.